Communicating the benefits of “biobased” content, the world’s newest ecological marketing term, is often tricky. Biobased represents all of green marketing’s traditional challenges — including greenwash — but has additional, unique challenges all its own. Happily, strategies and a credible third party label now exist. Shop ‘Til You Drop—but on Earth Day? This year seemed to produce a bumper crop of Earth Day promotions — and a lot of accompanying media backlash. Stories written by Marc Gunther, Matt Wheeland, and a NYTimes piece by Elisabeth Rosenthal are three I saw and I’m sure you saw more yourself. The media are making Earth Day marketers look like the moneychangers in the temple. Why is this happening? What can we do about it? With the development of social networking sites, user-generated content, and increased access to broadband technologies and personal computers, the Internet has been radically redefined and repositioned. This shift towards “Web 2.0” has changed the way we communicate with one another; it has democratized the way in which information is shared amongst users; and it has collapsed geographic, political, and cultural barriers, in turn redefining our perception of community. In his recently released Greener Products: The Making and Marketing of Sustainable Brands (2012, CRC Press, 222 pp. 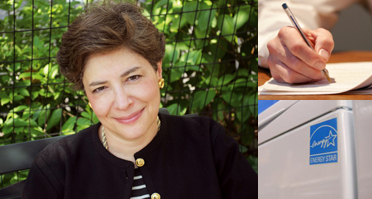 ), Al Iannuzzi offers a detailed and persuasive case for incorporating sustainability into your business model. Examining both the making and the marketing of green products, his writing is firmly situated in the language of business — making it a useful resource for both business leaders and students alike. In their new book The Method Method: 7 Obsessions that Helped Our Scrappy Start-up Turn an Industry Upside Down, Method cofounders Eric Ryan and Adam Lowry with co-author Lucas Conley take the occasion of their unconventional company’s tenth anniversary to step back, and offer readers the opportunity to peek inside their business, learning from their mistakes and acquiring the secrets to their success. 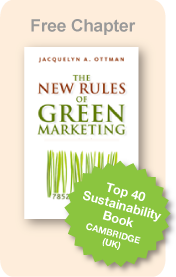 I’m thrilled to announce that my book The New Rules of Green Marketing: Strategies, Tools and Inspiration for Sustainable Branding was recently named to the list of Top 40 Sustainability Books of 2010 by the Cambridge Programme for Sustainability Leadership (CPSL), University of Cambridge (U.K.). Green Marketing. Not Dead, Just Misdirected. Some pundits declare that green marketing is dead. To quote Mark Twain, ” the rumors of my death have been greatly exaggerated.” I think the same can be said of green marketing. Here at Mind Over Markets we’ve been saying for years that green marketing messages have not been communicated correctly right from the start. Terrachoice’s Sins of Greenwashing Report—Time for Industry Self-Regulation? Most of you are familiar with Terrachoice’s “Seven Sins of Greenwashing” report. On a webinar aired in late October, CEO Scott McDougall admitted that his firm never intended to be malicious in their use of the term, “sins”. He believes that most of the “sins” of greenwashing being committed today are really not sins at all, but rather, inadvertent missteps.